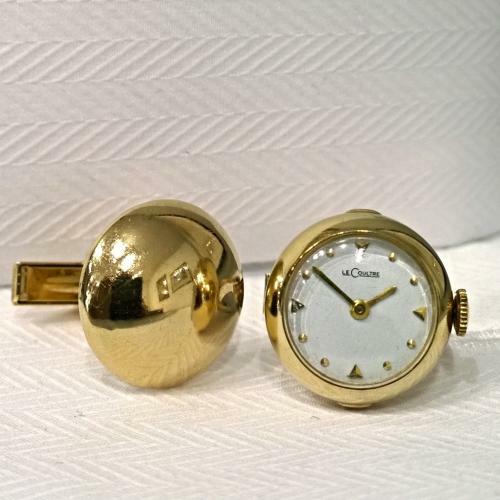 A pair of unusual cufflinks by Jaeger LeCoultre in 14ct gold made in the USA in the early 1960's. The dial signed LeCoultre, the 17 jewel Swiss movement signed LeCoultre and numbered, the inside of the case numbered and inscribed 'made and cased by LeCoultre in the USA'. Good working order and time keeping. LeCloutre and Jaeger LeCoultre were the same company making watches and movements in Switzerland they had been partners since 1937. LeCoultre in partnership with Vacheron was the American import company, movements were imported and cased in the USA.